Apparently, there is more than enough cash to go around with all the witches in the world. Click here to play! So, why not get in on the riches? 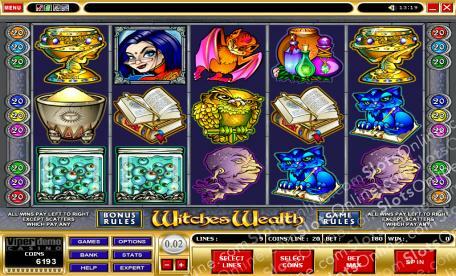 Witches Wealth is a fun 5-reel slot played across 9 pay lines of mystical madness! Look out for the Wild Witch; if you manage to snare her five times in one spin you will be paid out 6000 times your initial wager. She also works as a substitute for any other symbol on the reels except Mr. Twinkles. The magical cat known only as Mr. Twinkles can trigger two bonus games; the first when three or more appear on one line, which will send you to the Spinning Wand Bonus, and the second when five appear, which will send you to the Flying Rescue Bonus Round. The Witches Wealth is positively bursting at the seams, so help yourself to the massive cash jackpots on offer today! The Wild Witch can be substituted for any other symbol except Mr. Twinkles, and will pay out up to 6000 times your original stake. Three or four Mr. Twinkles will activate the Spinning Wand Bonus, while all five will trigger the Flying Rescue Bonus Round.